Seeing the word “dab” for the One Day at a Time blog carnival brought back memories of my mother’s cooking. Yes, this is another non-fiction entry. I just can’t resist. My mother is a pretty good cook, at least if you like food for the health-conscious. If you’re into extremely sweet or very low fiber, perhaps not so much. But amongst our friends when I was younger, her food brought many compliments. My parents believed in hospitality, and would frequently invite visitors home for lunch after church. If there was a pot-luck meal, we’d always be there with the appropriate dish prepared. With the compliments would come the inevitable request for the recipe. But my mother doesn’t really cook with precise recipes. Rather than things measured in cups, teaspoons, drops, or any such precise quantities, we would take “some” water, add a “dump” of flour, perhaps a pinch or two of salt, a splash of oil, and so forth. Then one might put a “dab” or two of oil in the bread pan before using it for cooking. Of course I’ve skipped ingredients and much processing, but you get the idea. I never really could get the idea, and neither could most other people. A “dump” doesn’t remain the same size. Four loaves of bread take a larger dump of flour, not to mention that “some” water changes in quantity. Mom could always get it in proportions, but it was very difficult to provide a recipe to those who requested one. She’d sometimes write one out, trying to figure out the proportions in “real” measures as best she could. To this day I can’t cook that way, even though I had to learn how to cook a number of different dishes, not to mention learning how to bake bread when I was younger. I need a detailed recipe. If the recipe happens to skip a step, no matter how obvious, it doesn’t happen. I was comparing this to giving instructions regarding how to do some process on a computer, something I find easy. My wife is less “loose” about her cooking than my mom is, but she still has a tendency to cook something until it’s done, rather than for 11 1/2 minutes. I set the timer to the second. She was telling me that I should know how to cook pasta by now and be able to tell when it’s finished. I asked her how long it had been on the stove. Then I pointed out that she likes her computer instructions to be very precise, probably for the same reason as I like my cooking directions detailed. Neither of us is comfortable in the other one’s natural space. So perhaps the special unit of measure we all need is several dabs of understanding. When you know what you’re doing and you’re comfortable with the equipment and the process, less precise units work just fine. But when you don’t really understand the process, the only option is to get—and follow—precise directions. Both my dad and my Uncle Don (Neufeld) had a suspicion of new cars. I recall a couple of times when we had a new or nearly new car, but generally we got something that was substantially used. I’ve inherited enough of that suspicion that my preference is to buy a car that has 20,000 miles or so on it. I lose the new car high price, and still have a reasonably recent vehicle for maintenance purposes. That wasn’t the way my dad looked at it. For him, a car was not so much a means of transportation as an occasional hobby. He could take it apart and work on it. Whenever anyone wanted to go somewhere, he could complain about the various problems the car was having, thus providing an excellent reason not to drive the car at all. There were many times we thought we might go somewhere when my dad would say that the car needed work, and so it sat in the carport or garage as the case may be. When we were in Guyana, South America, a number of folks at the hospital where he worked were quite unhappy with his choice of vehicle. (He was a doctor and medical director of Davis Memorial Hospital in Georgetown, Guyana.) A number of people in the administration thought his car didn’t look respectable for a doctor, especially a hospital’s medical director. 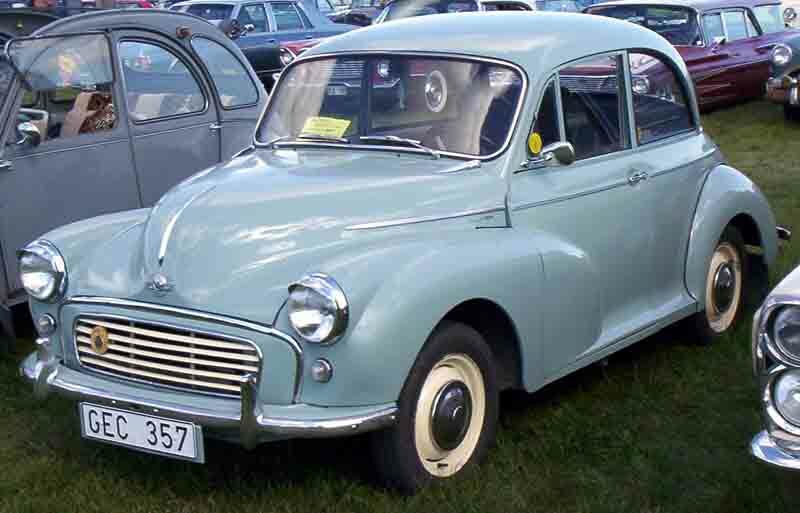 But he stuck with his purchase of a Morris Minor. I don’t know the year, but it looked a great deal like the 1960 model shown at the left. It was about that old as well—this was 1971. It did run from time to time. I recall a few trips across country and it ran fairly well. There was a joke amongst our friends about needing to feed the hamsters well, but that was an exaggeration. Nonetheless, people thought the car just didn’t look like a doctor’s car. My dad didn’t care. He spent many hours tinkering with that car. I don’t know whether he was keeping it running or making sure it stayed up on the jacks. He wasn’t always unwilling to use his cars. When we lived in Chiapas, Mexico, we drove a Mercury station wagon. I could tell a few stories about that little vehicle. It went any number of places it was not designed to go. For one thing, it’s 14 inch wheels made it pretty low, and we lived close to 90 miles from the nearest paved road. One of the forms of mulch we used for gardening at the little mission station we had there was coffee hulls. We’d haul these in by the van load. One day the folks who had driven their van to get the coffee hulls hiked back in. The van had broken down. They were going to take the four wheel drive vehicle we normally had available and tow the van in, but it wasn’t working. Dad had purchased a new tow cable on his last trip to the U. S. and had never used it. This was his opportunity. Everybody said the Mercury station wagon wouldn’t tow the van, especially with a full load of coffee hulls. But he was undeterred. I was only 8 or 9 years old, but I got to go along to see how this would work. We drove out to where the van was stranded, hooked up the cable, and eased that little station wagon off and believe it or not, that van came right along. We managed to tow it all the way back to the top of the hill where it could just coast on in to home. My first year in college I lived near my Uncle Don, and I discovered that he was no fan of new cars either. He had an old Chevy station wagon that had more than 200,000 miles on it. It ran quite well. He had a newer station wagon as well. My aunt Maxine told me that he bought the new station wagon just before making a trip across the continent. He chose to make the trip in the old vehicle because he didn’t trust the new one yet. She also told another story about that older car. My uncle was fairly high up in his church organization. Once he was the main speaker for a camp meeting. He was turned away from the pastor’s parking lot because they didn’t think his car looked like a pastor’s car. I conclude that perhaps there’s a reason to have fun with older cars! Private chapel, built just before 1900 by the Arts and Crafts inspired architect Sir Guy Dawber. It was never consecrated and is now maintained by the Friends of Friendless Churches and sadly is only open on Heritage open days. In October of 1999 I was engaged to be married. At 42 years of age I was acquiring a ready-made family all in one move. Over the years, that family has grown to include nine grandchildren. But that’s getting ahead of the story. The wedding was planned for November 28, Thanksgiving weekend, but in October I was headed to Europe. For the most part I was going to be traveling with a group of speakers offering revival services to various Methodist churches in England. I was kind of the junior member of the team, but in many ways that made it more fun. Friends told Jody, my wife to be, that I was getting cold feet. Otherwise why would I run off to Europe for three weeks that close to the wedding? My story isn’t about the portion of the trip that was in England. In the middle of the trip, I was to leave the group, fly to Germany, and speak at a conference there. Then I’d return and join my group. I separated from the group in the town of Matlock, and was left with a day on my own before taking the bus back to London where I would fly out to Frankfurt. I spent that day walking and looking for spiritual encouragement for the days ahead. I’m not a good traveler. I’m not that good at encountering new situations. I was quite comfortable being the junior member of a substantial team and wasn’t all that happy to be heading off for several days on my own. I had been told by someone that there was a chapel near Matlock Bath, which is just south of Matlock, and so I walked that way. I was in much better shape in those days! Just looking at the map as I prepared to write this story made me tired. I asked about the chapel a couple of times and nobody seemed to know. Finally, as I was following my map back from Matlock Bath toward Matlock, I came across a chapel. In preparing to write this post I looked it up on the map and found a picture. I don’t always trust my memory, but both the location and the appearance of St. John the Baptist’s Chapel in Johns Road match my memory of the place. I’m glad to see that since that time it has been designated a Listed Building. At the time I couldn’t get in, and it was not in great repair. Again, it appears that some work has been done on it, which is noted in the Wikipedia article linked above. Below the chapel on the road there was some water leaking and running under (I believe) Johns road. The view in the picture with the Wikipedia article is precisely the direction from which I approached. Seeing the water coming from below the closed chapel, I suddenly felt God’s presence. You can call me crazy, but I knelt down and splashed the water on my head and felt incredibly refreshed. In that most unlikely place I had found the encouragement I needed. For me the chapel was as old as the hills and as new as tomorrow. It may be a thing of yesterday by English standards, but it was worth the walk to me. I don’t suppose it will become a major tourist attraction. But the importance of a place and experience is, in most ways, a matter of perspective. “Old Jack has quite an arsenal,” said one villager knowingly to another. The stranger sitting in front of the village pub perked up. This was the sort of thing he wanted to know. “Farmer Jack,” said one of the villagers. “What do you mean that he has quite an arsenal?” asked the stranger. It was a risky question. People often reacted badly to someone who was too curious about their stock of weapons. But the two villagers just laughed. “You’d really have to see it,” said one. The other just snickered. So the stranger set about discovering just what kind of an arsenal it was that this Farmer Jack had. If his boss was to gain control of this village and the surrounding farms, he would certainly have to get rid of any arsenals that might be in the area. That evening he asked a few of the people in the pub about Farmer Jack’s arsenal. He wanted to do it subtly, but it was rather difficult. “I heard there’s a Farmer Jack around here who has quite an arsenal, ha ha, do you know anything about it?” That sounded rather silly, but the reactions he got just weren’t normal. Some people looked at him as though he was crazy. Others laughed. A couple of them finally explained that in the mountains behind Farmer Jack’s farm there was a cave which was filled with weapons. What weapons? Oh, swords, crossbows, crossbow bolts, maybe even a ballista or two. One never knew what Farmer Jack might collect. He thought he noticed a number of people trying to conceal their faces. He thought it might be that they were laughing, but he set that aside. What could be funny about a cache of weapons? That was one of the things his boss would want to know. He’d want to grab the arsenal first. Over the next few days he tried to watch people as they went about their business, especially as they went to surrounding towns. But he never saw what he was looking for. He wanted to see some town militia or maybe even one or two people going and getting weapons or putting them back there in the arsenal in the hills behind Farmer Jack’s farm. So he sent in a report to the boss and the boss sent a couple more scouts to the town. It was important to locate this arsenal before he made his move. His men would be spread thin, and even one well-equipped militia might be able to bring down his entire plan to control the area. The new men actually scouted the area behind Farmer Brown’s farm. They looked through the hills, but they didn’t find any weapons, nor did they find anywhere that weapons might have been stored, nor did they see a single person carrying weapons one way or another. Well, except for one hunter who was using his hunting bow to hunt deer. They thought the hunter hadn’t seen them. It was important that nobody realized they were looking for the arsenal. That would just make people start to believe they were planning something, and that would be dangerous. Finally the boss decided to make his move. In order to make certain that everything was safe, they decided to send the majority of their troops to secure Farmer Jack and to close off the path to the arsenal. It wouldn’t do, after all, to let people go get weapons from there. They swept across the farm, surrounded the house, and grabbed Farmer Jack. The captain in charge of the operation congratulated himself on his success. There wasn’t so much as an injury, provided one didn’t count Private Smythe, who had turned his ankle in a post hole in one of the fields. “I don’t know what you’re talking about,” said Farmer Jack. The captain slapped him a couple of times, but one of his lieutenants pointed out that with such an old man, a slap might even be fatal. So they just told Farmer Jack that he might as well tell them, because they’d be there until they figured out where the arsenal was. They’d find it eventually, so why not make things easy? But Farmer Jack seemed uninclined to make things easy. He just sat in his big living room chair and thought. In the meantime, the captain’s men made a thorough search of the area for the arsenal or for any path that might lead the the arsenal. They didn’t find anything that wasn’t part of the ordinary farm equipment. But at least, thought the captain, nobody else could find it either. Just after dark they heard the sound of horse’s hooves on the path leading to the house. Such men as weren’t still searching for the arsenal prepared to stop the approaching horses. But what met them was a knight on his horse and with him several men-at-arms. If they’d all been there, they might have stood up to him, but as it was, they had no chance. The men surrendered quickly, and it was only minutes before the knight was in the house with Farmer Jack. Now the captain was sure there was an arsenal, cleverly hidden. What else would make an obviously well-off and well-equipped knight show up at one very old man’s farm? “The arsenal?” said the knight. The knight stood staring at the captain for a long time. Then he started to laugh. He laughed long and hard. Finally he got control of himself. “You think there’s an arsenal around here?” he asked. The knight turned to Farmer Jack. “I take it the current crop is safe,” he said. “So we really didn’t need to go after this farm at all,” said the captain. “I think you misunderstood. I came to this town looking for justice. A rich man in my village robbed me, and I came here for justice.” The woman looked bewildered. Justice—for that was indeed his name—just looked stubborn. This is a work of fiction. Any resemblance of the characters, places or events to anything in the real world is strictly coincidental. “I want Justice!” she yelled. Then before Justice could frame his reply (he had been about to say “I am Justice” again) she got back on her donkey and started to ride toward home. She was nearly out of money. She couldn’t go any further. What’s more she was so disgusted with this joke that the townspeople had played on her, doubtless taking her for a rustic stranger, that she didn’t want to go further. So when this very troubled woman headed off down the road into the hills, Justice decided that he couldn’t leave things as they were. When people called him he was always able to help. It was like a law of nature in his mind. It never occurred to him that the reason he could always help was that people always called him to do things that required strength, like moving their furniture. Nobody even noticed when Justice grabbed a bag, filled it with clothes, a few tools, and a little bit of food, and headed off down the road. They assumed he would be back sooner or later. He was a fact of life. Five days later, Justice showed up in the tiny village of Marani. He settled himself in at the local inn and ordered ale. It was hard to miss Justice. In a room full of people he stood out. People were afraid of him. Not that he looked angry or made any threatening moves. It was just that he looked like he might carry off some of the furniture without noticing he’d done it, sort of like other people might pick up a coin. “What lady?” they asked. But Justice just kept his silence. The people thought he was being enigmatic, but the problem was that he didn’t know the lady’s name, nor did he know who it was who had robbed her. By the next day the lady heard that Justice was in town. She didn’t go to see for herself. She didn’t want the Lord Mayor, as he styled himself, to realize she had asked for someone to come to town. Especially since she hadn’t. By evening, however, the Lord Mayor got word that Justice had arrived in town. Justice, said his agents, was very large and muscular, and could doubtless carry away the inn on his shoulders should he choose to do so. “Perhaps his presence here is just a coincidence,” said the steward. “But he says he’s here to help the lady,” said one of the agents. “It could be some other lady,” said the steward. The Lord Mayor just looked at the steward, but his eyes said, “You idiot!” That was what he was thinking, because there really wasn’t any other lady that Justice could be here to help. “Yes, but he is,” said the Lord Mayor. The next afternoon the Lord Mayor stopped in to see Justice. Justice seemed uninterested in the problems of ladies at the time, and just wondered if the Lord Mayor needed anything moved. The Lord Mayor concluded that Justice was very enigmatic, and was playing with him. The fact was that Justice was smart enough to realize he would need money if he was going to stay in the inn, and had already made quite a bit by moving large things for various people. Next the Lord Mayor went to the lady and asked her, quite belligerently, whether she had asked Justice to come to town. She told him the truth, that the people in the town had sent her Justice when she asked for justice, and now that the young man had followed her here. The Lord Mayor laughed and laughed. But when he got home he heard about Manny the pickpocket, and how Justice had broken his arm when he found it in someone else’s pocket. People were starting to say that justice had been done. By Justice. Justice had no such plan. He just didn’t like to see people robbed or hurt. He hadn’t actually intended to break the man’s arm, but Manny had struggled so hard while failing to let go of the stolen purse, and Justice being as strong as he was, he accidentally broke Manny’s arm. Perhaps there was more to this than he supposed, thought the Lord Mayor. So he told one of his agents to kill Justice. Maybe he was just a strong young man, but maybe not. Might as well be safe. The agent spent all that evening looking for a chance to slip a knife into Justice, but he never really got a chance. Every time he got close enough he was somehow blocked. He was perfectly willing to do the deed in public. The Lord Mayor (as he styled himself, of course) would protect him. But he could never quite get into position. Justice was always turning to face him at just the wrong moment. Now the Lord Mayor was really concerned. Could it be that this was an expert agent of the Baron, or perhaps even the Duke or the King? He needed to think of some way to do something about it, but what could he do? If the King, heaven forbid, was aware of his activities way out here in the wilderness, what else might he know? He tried twice more to have Justice stabbed in the back. The second guy actually managed to swing his knife at Justice’s back, and cut him, but he just threw the attacker against the wall (a couple of broken ribs and a dislocated shoulder), and went about his business. By this time the Lord Mayor was so worked up, he was convinced that an agent of the King was playing with him, and that it was only a matter of time until he was arrested, taken to the capital (so far away he wasn’t sure where it was), and doubtless beheaded. After another quite day or two (ominously quiet, thought the Lord Mayor), he decided that his only option was to flee the town before he was taken. So he loaded most of his riches on a mule, and got on his best horse, and headed out of town early in the morning. What he didn’t realize was that Justice also went out for walks in the hills early in the morning. So as the Lord Mayor left town, there was Justice standing at the edge of the road, looking out over a valley. Justice was just enjoying the view, but the Lord Mayor was certain that Justice was there waiting for him. He had one chance, he thought, and that was to push Justice over the endge of the cliff. The drop off wasn’t very high, but it would be high enough. He spurred his horse forward, intending to turn just as he hit Justice, and thus be rid of his problem. But hearing a horse behind him, Justice stepped aside. The horse managed to stop right at the edge, but the Lord Mayor flew out into the air and with a scream fell to his death below. Justice verified that the Lord Mayor was dead, then took his body, his horse, and the mule containing most of his riches back into town. The townspeople gathered around, and called the lady. She took the horse and the mule, and its load, and claimed the Lord Mayor’s house. It had all been stolen from her in the first place. Yes, I am Justice,” said Justice. But he looked puzzled. He still had no idea what the lady wanted him to do.